“Joy of Flowers” was created for an online quilt competition organised by Husqvarna India. To see my entry “Joy of Flowers” click on this link: My entry. I must give credit to my beautiful son for coming up with the creative concept based on a photo taken by my husband in Floriade, Canberra. The photo was of a bed of tulips against the lovely clear blue sunny Australian Sky. This would be my first true art quilt and and also first quilt that I actually completed all on my own, right up to the quilting. I have been observing art quilts for years and have read on it and also taken a class on how to create these. The most common method used to produce art quilts is by raw edged applique. However, for me that seemed incomplete and also at that time I was not too good with my Free Motion Quilting (FMQ) so would not have been able to successfully quilt over the raw edges, so I decided to use the traditional piecing method. Once I decided on my course of action I then set to work on the execution of this concept. I started by doing a sketch of the design using a paper and colour pencils and worked out all the measurements and colours I was going to use. Later on when my quilt got accepted by the Australian Patchwork & Quilting (AP&Q), I created the whole design on EQ 7, by tracing the image and working on custom blocks. 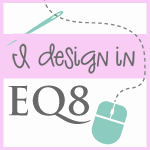 This was my first original design created on EQ 7. The colour palette used for the quilts was to give authenticity to the colours in the photo. The tulips were a classic Red and Yellow/Orange and leafy Green colour was used for the leaves. The colour of the sky reflected the blueness of a spring sky so I chose a myriad of blues from smoky blue to sky blue and the fabrics used near the sun were a range of sunny yellows. The grass colours were to give an illusion of green grass on garden bed of brown soil. The quilting was done by using the walking foot method and that was actually my first time that I confidently quilted an entire quilt on my own. I chose to finish off the quilt by using a facing rather than a binding at the edge. I often use this method when I want the viewer of the quilts to focus more on the quilt design. This quilt was then accepted by the AP&Q magazine as its cover quilt in July 2016 and recently in March 2017, in a readers competition the AP&Q cover chosen as the most liked was the one with “Joy of Flowers” on it. Please have a look at the photo gallery on how the quilt was made.